One of BUAid’s current projects focuses on more efficient treatment of post-traumatic stress disorder (PTSD) amongst war casualties. BUAid initiated and co-ordinated a panel discussion on Psychological Rehabilitation of War Victims in Ukraine, which was held at the Embassy of Ukraine in London, on the 12th November 2015. The participants addressed a wide range of issues and challenges of psychological rehabilitation and reintegration of different groups affected by the conflict in the East of Ukraine. The panel examined the need for new research into PTSD arising from widespread mobilisation amongst the civilian population of Ukraine and its long-term effects. The discussion provided the foundations for further collaboration and exchange between the British and Ukrainian specialists in the field of PTSD. 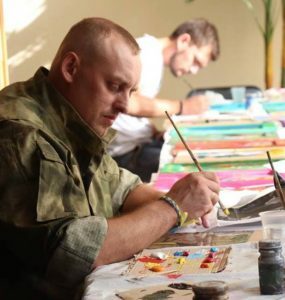 Thanks to BUAid’s co-ordination and fundraising efforts, which were supported by the Embassy of Ukraine to the UK, Ukrainian Medical Association of the UK (UMAUK) and the Association of Ukrainians in Great Britain (AUGB), London Branch, 16 ex-combatants were able to undergo a week-long Art Therapy Rehabilitation course provided by our partner organization in Ukraine “Zigriy Nashu Dushu” at “Prolisok” resort in the West of Ukraine on 27th July – 2nd August 2016.